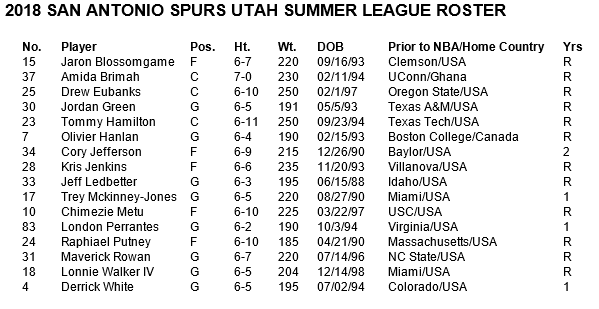 SAN ANTONIO (June 28, 2018) — The San Antonio Spurs today announced their roster for the 2018 Utah Jazz Summer League. The Jazz Summer League will take place from July 2-5 in Salt Lake City. 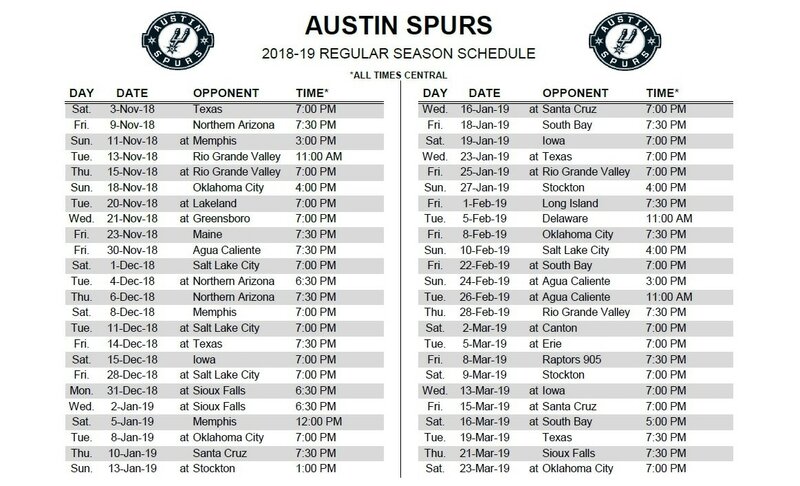 This year’s roster includes Spurs guard Derrick White along with 2018 draft picks Lonnie Walker (18th overall selection) and Chimezie Metu (49th overall pick). In his first season with the Silver and Black, White appeared in 17 games, averaging 3.2 points and 1.5 rebounds in 8.2 minutes. He also saw action in 24 games with the Austin Spurs, San Antonio’s G League affiliate, averaging 20.1 points, 5.0 rebounds, 3.3 assists, 1.33 steals and 1.17 blocks in 28.2 minutes helping guide them to the 2018 NBA G league Championship. In last year’s Utah and Las Vegas Summer Leagues, White combined to average 11.8 points, 2.7 rebounds and 1.8 assists in 24.3 minutes in six total games. Walker played last season at the University of Miami, leading the Hurricanes in scoring by averaging 11.5 points to go along with 2.6 rebounds and 1.9 assists in 27.8 minutes in his 32 appearances. The Reading, Pa. native was named to the ACC All-Freshman Team in his lone season at Miami. Walker also became the first freshman in school history to earn all-league honors, receiving Honorable Mention All-ACC, while helping the Hurricanes finish 22-10. Metu spent last year at the University of Southern California earning All-Pac-12 First Team honors. The Lawndale, Calif. native averaged 15.7 points, 7.4 rebounds, 1.6 assists and 1.74 blocks in 31.0 minutes in 34 appearances last year during his junior season for the Trojans. Metu played in a total of 104 games and averaged 12.3 points, 6.3 rebounds, 1.2 assists and 1.62 blocks in his three seasons at USC, finishing his career third in school history with 168 blocks. Spurs assistant coach Will Hardy will have head coaching responsibilities in Utah. Complete coverage of the Spurs summer league action, including box scores, photos and game summaries, will be available at spurs.com.